There are not as many tools for working with the Septuagint as with the KJV or the NIV. There is a concordance listed on Amazon, but it is expensive and written in Greek. If you want to search for a word in the LXX you can use the excellent free resource, the E-Sword program. The search is more time-consuming, and will not be as exhaustive as Strong’s or Young’s, but you can delve into the usage of the word in the Greek using this tool. You must know enough Greek to recognize the word you are searching. And since Greek has different word endings for different genders and cases be prepared to search more than one word ending to get sufficient insight into the word you are researching. For our example we are going to look for the word “logos” in Greek. We want to see where these words in the first chapter of John have been used, at least in the translators viewpoint, in the Septuagint. In the example above, I went to the Septuagint version tab, and and found Jeremiah chapter 1 verse two because I knew that the “word of the Lord” used the Greek word logos. 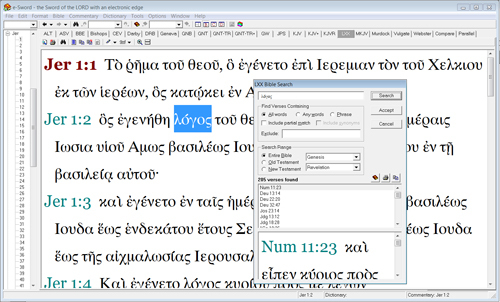 Then, as seen in the picture I highlighted the Greek word logos, opened the search dialog box, and pasted it there. Once I clicked Search it brought up 205 verses where that particular spelling is used. I say spelling because the Greek search is not as intuitive as a search for an English word would be. The program only finds that exact spelling, including the accent marks. In English you can put in the root form of the word, and then click on “include partial match”, and it will find multiple forms of that word. I did not find that E sword will will do that with a Greek root. Still this is a valuable tool, as is illustrated in the example above. There I found hundreds of usages of the word I was looking for. Having those I can begin to analyze the meaning by examining the way it is used in the various contexts it is found.